The I Congress of Eurasian Association of Pediatric Neurosurgeons took place from November 29 till December 1, 2017 in Minsk. More than 320 leading specialists from 17 countries arrived to belorussian capital. Lecturers and participants came from Brazil, the UK, Germany, Israel, Italy, Kazakhstan, Moldova, Russia, the Ukraine, Japan. The program included thematic breakout session, plenary lectures, satellite symposiums of scientists. Alexander Konovalov, neurosurgeon, and Igor Pronin, academic of the RAS, gave lectures during the Congress in Minsk. Technical organizer of this event was the company “Go Bel Tur”. Hydrocephalus: diagnostics, methods of treatment. Hydrocephalus surgery complications. Central nervous system cysts: diagnostics, indications for surgical treatment. Contemporary issues of diagnostics and treatment of children’s central nervous system malformations. Tethered spinal cord syndrome in pediatric neurosurgery. Neonatal neurosurgery. Hemorrhagic disease if the newborn. Functional neurosurgery (epilepsy, spasticity, hyperkinesia, etc.). Children’s tumors of central nervous system. Epidemiology and organization of pediatric neurosurgical care. Anesthesiology and emergency care medicine in the sphere of pediatric neurosurgery. History, ethics and humanitarian problems of pediatric neurosurgery. 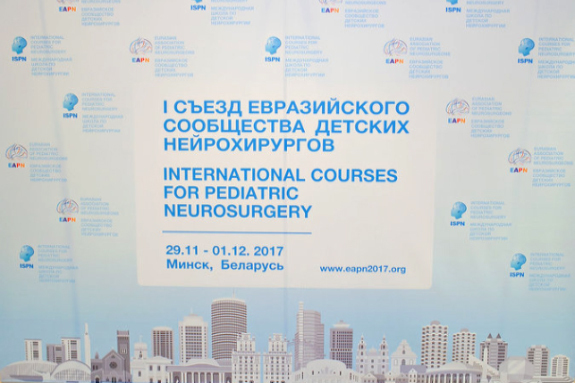 The official courses organized by the International courses for pediatric neurosurgery (ISPN) took place during the congress in Belarus for the first time. This credible organization holds an annual only a few courses worldwide. This year they held in China, the Republic of South Africa, Argentina. Belorussian pediatric neurosurgery has reached a new level. Specialist of the Republican Research and Practice Centre perform 120-130 surgeries to remove of a brain tumor by patients to 18 years. With regard to the treatment of an epilepsy, in the Republican Research and Practice Centre perform surgeries for the treatment resistant to medicines diseases the third year. Оrganizers of the Congress were the Ministry of Health of the Republic of Belarus, Eurasian Association of Pediatric Neurosurgeons, All-Russian Society for Pediatric Neurosurgery, the Ukrainian Society for Pediatric Neurosurgery, International Society for Pediatric Neurosurgery (ISPN), European Society for Pediatric Neurosurgery (ESPN) and etc.